Recently I had the absolute pleasure of interviewing Dr. Sinead Kane, PhD, BCL, LLM, Lawyer, International Speaker, Blind Adventurer and Consultant (Phew!) over a delicious cup of Bewley’s Coffee in my old alma mater, Bewley’s Café on Grafton St. in Dublin. It was a thoroughly fascinating experience for me and when we finished recording the video we realized that all of it deserved to be seen and/or heard so rather than cut it up, we have decided to offer it out in three parts. This is the final part 3 of 3. Truthfully, the best way to get the most from this lady’s fascinating tale of overcoming and achieving, is to watch the video (13 mins, very highly recommended) or listen to the podcast (13 mins, highly recommended) but in case you prefer the written word I have done my best to capture the spirit of the conversation in writing below. Ps, in case you missed them, I have provided a links to Part 1 and Part 2 at the end. … so anyway, I’m in the pool and this guy comes over and starts swimming beside me and he sounded very much like Bertie Ahern (our former Taoiseach, – Prime Minister). I’m thinking would this be a compliment or an insult, to tell him that he sounded like Bertie Ahern? So I decided to just say it, I said – “I hope you don’t mind me saying but you sound very much like Bertie Ahern”. And he says, “That’s because I am Bertie Ahern.” And I’m thinking, “What do I say now? What do you talk about now? So I just blurted out, ‘Oh, by the way, I’m going to the Atacama Desert, this is why I’m in the swimming pool, blah, blah… ‘ I can’t even fully remember what I said but just to get over that awkward silence, I just started talking. It just shows the power of networking, that you can meet absolutely anyone, anywhere! Me: That’s a great story. I agree, you can meet anyone anywhere, so long as you are out there. Sinead, there are two last questions I want to ask, but before I do, you mentioned you’d like to tell us about your visual impairment, can you tell us more? Sinead: I was born visually impaired. I have aniridia, coloboma, nystagmus and glaucoma. Aniridia is where you take in too much light. I don’t have the coloured part of my eye so it’s like all of my eye is exposed. You take light in through your pupil, but if you were to take off the coloured part of your eye, whether green, blue or brown, then it is all black and you take in light through it all like an open camera lens. That’s why I squint a lot; I take in a lot more light than you. A lot of people think of blindness as darkness, but for me, I suffer from too much light. Imagine a car coming at you with it’s full floodlights on, that kind of dazzling sensation is what I get all the time. Even these lights in the room, if I look at the lights there’s all rays coming out of them and when I tell people, they think I am hallucinating! Coloboma is the part missing from my eyes, the iris. Nystagmus is a shaking of the eye; there might be one step, and I’ll see two, or vice versa. With that too, I don’t see depth, so a lot of things look flat whereas there might be depth there, like a step. Glaucoma is too much pressure in the eye. That’s all since birth and everybody in my family is visually impaired as well. Being visually impaired has it’s limitations and people often ask how do I find being visually impaired, but I’ve never lived in a fully sighted world so I can’t really compare it. A lot of people also ask me about the World Marathon Challenge…”Ooh, that must’ve been really, really difficult.” But for me, the World Marathon Challenge, doing seven marathons, seven continents, in seven days wasn’t even that difficult! And I don’t say that arrogantly, but for me, my life has all been about being comfortable with being uncomfortable because I experience so adversity on a daily basis in terms of my disability, bullying, ignorant people, fighting for my rights, navigating the streets… if there’s building works going on… simple things like being in the supermarket, when they change the prices, making price tags smaller, or if they change the layout…so basically with the World Marathon Challenge, there was a finish line; with my disability, there is no finish line. I was told by age twenty-one I’d go totally blind, that hasn’t happened. I use a white cane, I don’t use a guide dog. Sometimes if there’s a stretch of road, I’ll try have a small bit of independence and go out and run it from A to B but I can’t go into races by myself and I can’t drive. I could sit here and list to you all the things I can’t do not I try not to focus on the things I can’t do because I’d get too depressed. With the World Marathon Challenge, whether you are visually impaired or not; I was expecting to feel sad when it was over because I had been preparing for that for a year. It’s kind of like what they call, pro athlete depression and I was expecting it sometime later, a week, a month, three months, but it actually came as soon as I went over the finish line. As soon as I did, I put my head in my hands and started crying. Everyone thought I was crying with relief that it was all over, or glad that I just got a Guinness World Record, but I was actually crying because, to me, that was the end. John, my run coach said, “Sinead, it’s not the end, it’s the end of this chapter.” In that moment, I didn’t really want to hear that, you just want to feel sad. If there had been an eighth continent and an eighth marathon, I would have done that because for me, I had just gotten into that routine every day. I believe thought that with our goals in life, fear stops us. Me: That’s why I find your story so fascinating and I think our readers will too, because we all struggle with fear; you struggle with fear but you just get up every day and you overcome it, in big ways and small. It’s about having courage. Courage has a ripple effect. Once you show courage it ripples out and you inspire others. Me: That’s why I feel you are in exactly the right profession being a professional speaker because your story will empower others. It annoys me when fully sighted people don’t participate but when you are talking about being a professional speaker, you can’t let that anger come across. That was one speech where I got very angry and I had to really have a poker face. Me: Don’t beat up your clients, probably not a good idea! Sinead, you know my career changed the moment I met The Man on the Train, do you have a moment like that? One moment when everything pivoted, one moment that everything hinged on? Sinead: Different moments have struck me throughout my life, but no ‘one moment’ that everything centres on. For example some years ago, a very, very close friend died. It comes back to gratitude; don’t sweat the small stuff. Then there was the incident with my careers guidance teacher when I was seventeen (see Part 1). Another pivotal moment for me happened in 2009. I had just qualified as a solicitor, and the crash happened in Ireland. I had spent seven years to get to that moment and one month later I was out of a job because of cutbacks in the public sector. I was on a temporary contract on the legal aid board and anyone on a temporary contract couldn’t be renewed because of the embargo. Interlinked with that, a pivotal moment was when I couldn’t get that job I tried other ways to get a job as solicitor because I really badly want to be a solicitor, so I went to the Law Reform Commission, got a voluntary internship with them, traveling up and down every day to Dublin, up every morning 4am, back home 11pm Monday to Friday for six months in 2010. In 2011 I was in the Department of Public Expenditure and Reform in Dublin and in 2012, as well as doing a lot of voluntary work, I got a job as a solicitor. I always thought if I ever got a job as a solicitor on South Mall in Cork, I’d have made it. So I have this so built up in my head… it was kind of like, oh, if I win the lotto, then I’ll be happy… and then I got this job as a solicitor on the South Mall in Cork and I thought, “Is this it?” I had built it up to be so much in my head, but I was bored by it. That was another pivotal moment for me in that you can build something up to be happiness and then when we get there we are disappointed, so why not just be happy for today, because you don’t know if you’ll have happiness tomorrow. Me: Well said. I also think the Universe had different plans for you though. I think having Dr. Sinead Kane hidden in the back of an office somewhere, rooting through files wouldn’t serve the world very well. Anyway, what’s next? What’s the 2020 Vision? What’s the big plan? Sinead: I think I’m the type of individual, I don’t know will I be a speaker this time next year – not because I’m a bad speaker – but because I get bored very easily and I like being challenged and I like to challenge myself in different ways, you know, maybe politics? We’ll see how the speaking goes, you’d never know, I might go back to being a solicitor again. I’m not quite sure. You’d never know, there might be a book in me. Me: You heard it here first folks. Sinead; I might start spending time on a book. I suppose for me, if I am to do a book, I want to make sure the proper knowledge is there for people; watch this space. If any of your readers have an opening, they can send their queries to me and I can consider it. Sinead: I think I want to do more travelling as well, learn about different cultures and I want to do that through racing. Me: Fantastic! I have no doubt there’s a book in you, in fact I’d say there are many books in Sinead Kane; you’ve lived so many lives already and many more to come I’m sure. Dr Sinead Kane, it’s been an absolute pleasure, thank you for joining us here today. Me: Folks, there you have it. See a link to Sinead’s website below. If I may thank you all for joining me for this series of, for me at least, thoroughly enjoyable and fascinating “Coffee with Colm” interviews with Dr. Sinead Kane in Bewley’s of Grafton St.
My very best, on your behalf to Dr. Sinead Kane in her future endeavors. Watch | Listen | Read | Think. Dr. Sinead Kane’s Interview: Part 2. Sinead has “Coffee with Colm” in Bewley’s Café on Grafton St. Dublin – click here. Dr. Sinead Kane’s Interview: Part 1. 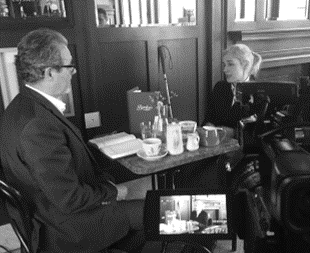 Sinead has “Coffee with Colm” in Bewley’s Café on Grafton St. Dublin – click here. The Man on the Train story – click here.